After a long hiatus, I’ve decided the first update needs to be another Russian favorite. 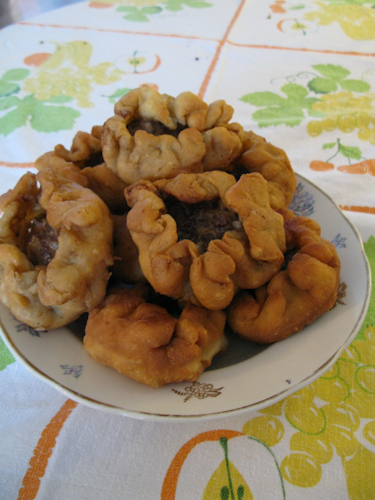 This one is a very old Russian recipe and is actually Tatar in origin. Like with many old dishes, there are a large number of variations of this one. However, this particular recipe is how my family’s been doing it for a couple of generations. 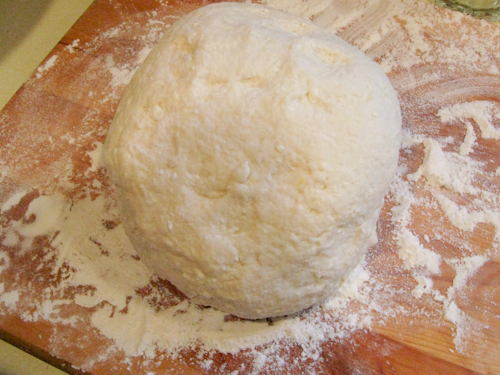 What makes it more unique than others is the use of tvorog (farmer’s cheese) in the dough. 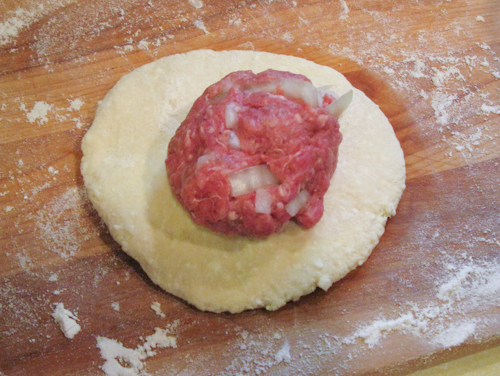 The result is a much more savory and crust to go with the meat filling. 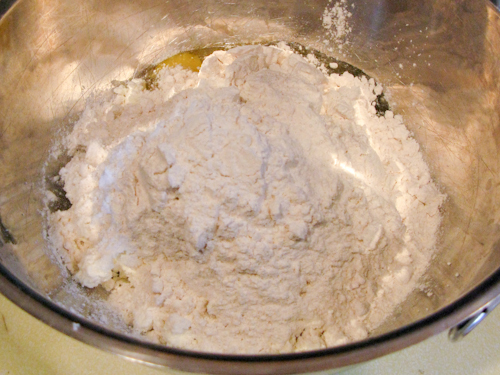 Combine all the dough ingredients in a large bowl and add the flour. 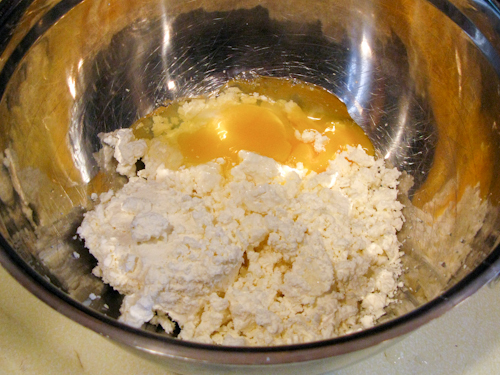 Mix and then knead the dough until uniform consistency and it no longer sticks to your hands. 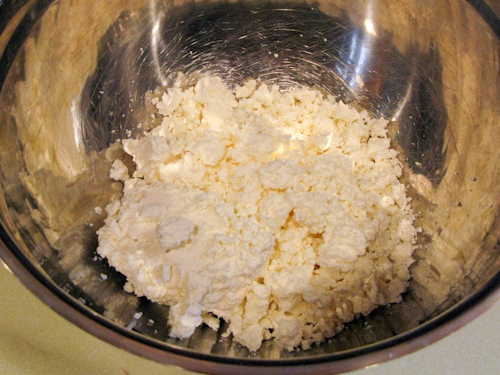 Start with a cup of flour and add more until you get to the desired state. 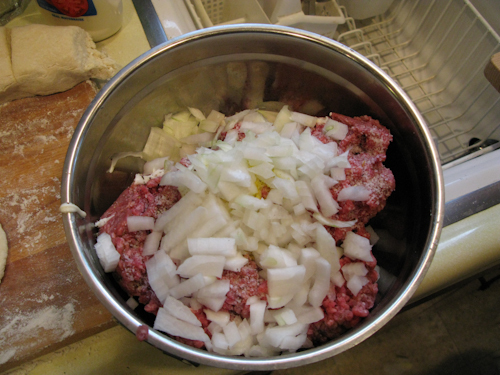 Prepare the meat filling by combining all the ingredients in a large bowl. In a large sauce pan or a pot pour about 0.5 inches of oil. 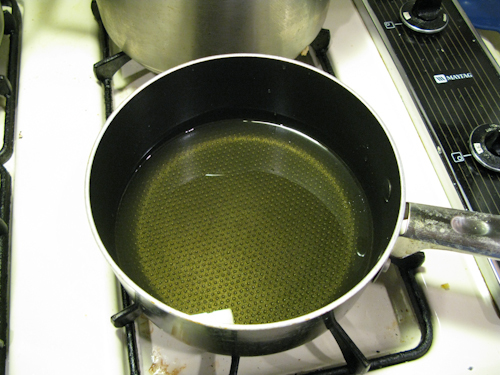 Heat the oil until it starts bubbling and lower the heat to medium-low. 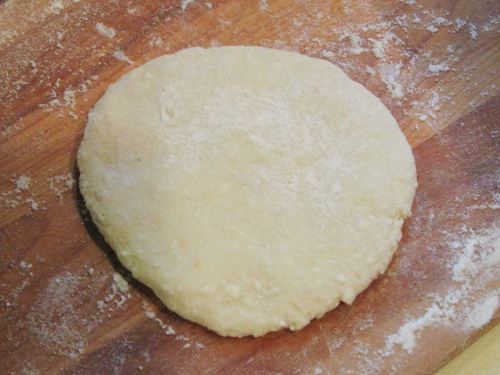 On a floured surface, roll out small pieces of dough into approximately 3 inch circles. 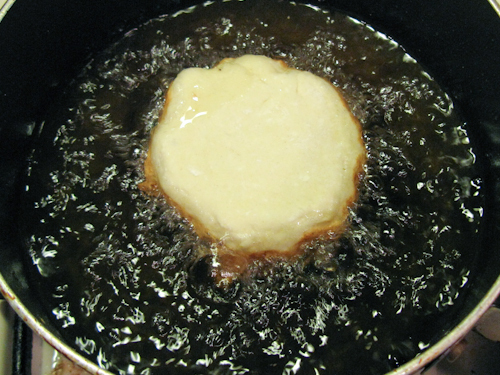 Make them as thin as possible without the dough easily ripping. 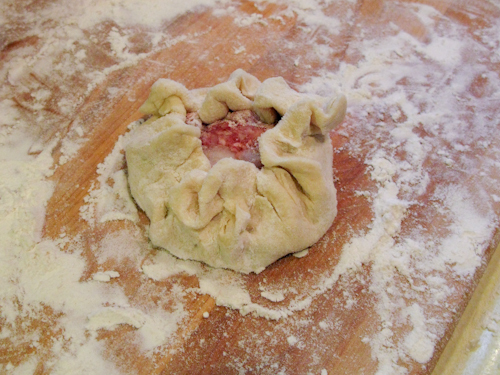 Place approximately a 1 table spoon of the filling into the center and pinch up the edges of the dough until only the top of the filling is sticking out. 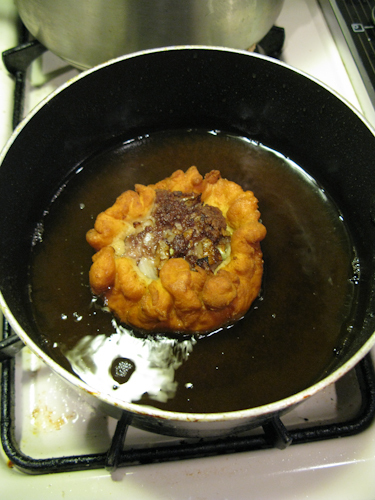 Using tongs, drop each meat pie into the oil with the meat facing downwards. Let cook for approximately 5-10 minutes and flip and give another 5-10 minutes. If you’re using a sauce pan you can cook 3 to 4 at a time. The long cooking time is essentially to cooking the filling through. Posted in: appetizer, Beef, Dairy, Meat Dishes, Pork. Those look awesome!! I love fried foods. 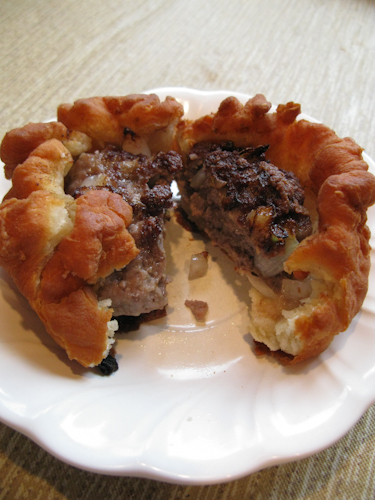 Kinda like Pirojki, just open on one end. I bet they taste great! Great recipe! I love your dough! Most others require yeast, but the cheese addition intrigued me so I gave it a try with great results! I used cottage cheese and so I had to add quit a bit more flour but they turned out light and airy. I had leftover dough so I made them into donuts with sweetened cream cheese and lemon juice as the filling and sprinkled with powdered sugar. This is a keeper, thank you for sharing! You could just reshape the dough to look like a Samosa and not fry it, but put it in the oven. So instead of yummy tvorog, I used cottage cheese and about 3 1/2 cups of flour the first time I did this. The second time, I got smarter and let the cottage cheese sit in a plastic colander for a little bit. I was able to cut about a cup and a half of flour out of the extra. 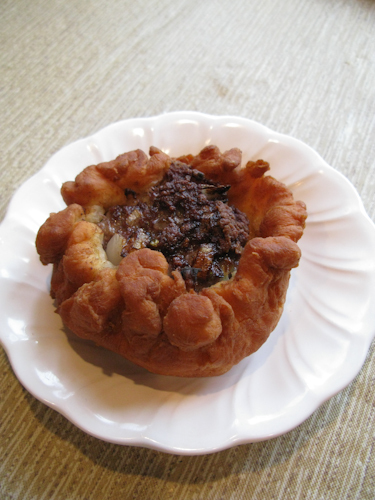 4) just recommendation : yes, you can fry belyashi, but it way more healthy to bake them. Best regards.